Philadelphia Eagles tight end Trey Burton. It's no secret that the Philadelphia Eagles, who are projected to be $10 million over the NFL salary cap when the new league year begins on March 14, are going to have some tough decisions to make this offseason. It takes a lot of talent to win a Super Bowl – even more so when you lose as many players as the Eagles did and still find a way to win – and as a result, teams often don't have the money to keep all their top players from the previous season. Several key Eagles players will hit the free agent market in about a week and a half, and one of those players is Trey Burton, who scored a career high five touchdowns this season. After throwing arguably the most-historic touchdown pass in team history in Super Bowl LII, Burton will reportedly not be re-signed by the Eagles. 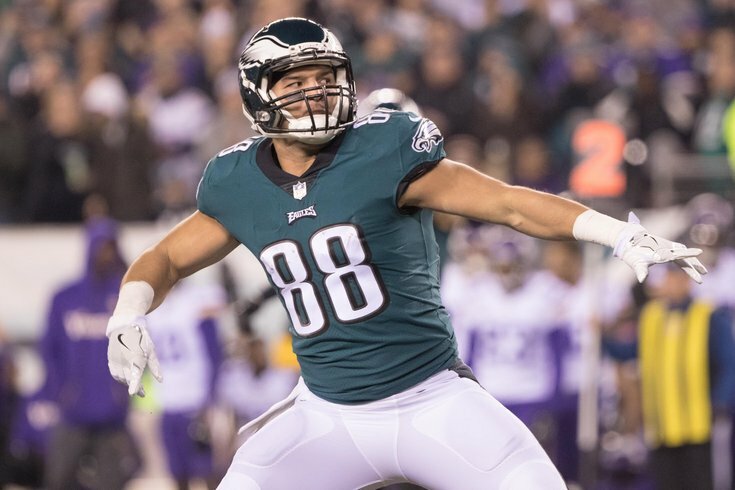 With the #Eagles stocked at TE and dealing with cap considerations, free agent Trey Burton is expected to leave Philly. He had 16 teams check in on his status this week, and he’ll have a strong market. The reason Burton won't be playing in Philly in 2018 likely has more to do with those 16 teams showing interest than it has to do with performance. As a backup, Burton hasn't posted eye-popping numbers, but he has shown flashes while filling in for Zach Ertz when the starting tight end was injured. And after catching just three passes through his first two seasons, Burton caught sixty passes (and scored six touchdowns) over his last two. Burton, who has been with the Eagles since they signed him as an undrafted rookie free agent back in 2014, cost the team $2.8 million last season after the Birds tendered him at the second-round level as a restricted free agent. This time around, there's going to be a lot of interest in Burton with 16 teams potentially bidding against each other. And with the Eagles desperate to get under the cap, there's likely no chance they'd be able to afford the 26-year-old tight end. Our own Jimmy Kempski, who also believes veteran tight end Brent Celek could be a cap casualty before too long, pointed this out nearly three weeks ago during his annual "Stay or Go" series. Burton has been a tremendously useful player for the Eagles, serving as a core special teamer, and something of a jack-of-all-trades within the regular offense. In the two games Ertz missed this season due to injury (Broncos and Rams), Burton showed up in a big way, catching 7 passes for 112 yards and 3 TDs. Unfortunately for the Birds, Burton will be a free agent on March 14th. #JimmyVerdict: I believe that some team out there is going to pay Burton like a starting tight end, and the Eagles simply don't have the resources to compete with offers he'll receive. As you can see, Burton played an important role for the Eagles, and many of his contributions often go unnoticed by fans. Unfortunately, that's not the case when it comes to other teams' personnel departments.